The Congregation of Marians of the Immaculate Conception have been promoting devotion to Divine Mercy since 1941. They promoted St. Faustina’s messages from 1941-1959, but then a ban was put on them by the Vatican because of faulty translations and the inability to access the original Diary at the time. Thanks to the work of Archbishop Karol Wojtyla, the objections were resolved and the ban was lifted in 1978, six months before he would become Pope John Paul II. Once again able to talk about Sister Faustina, the Marians worked to edit her Diary in the original Polish and then produce an English translation. They knew a film should be made about her life and the message of Divine Mercy. This was done in 1987. 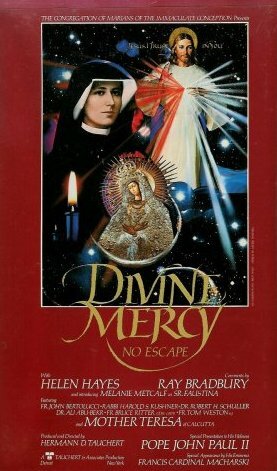 The film, Divine Mercy No Escape, premiered on September 15, 1987 at Grauman’s Chinese Theater in Hollywood. There was a good reason for this. At the time, Pope John Paul II was making a papal visit to the United States and meeting with various groups. One of the groups was all of the bishops of the United States. He met with them in Los Angeles on September 16 at the Minor Seminary of Our Lady of the Angels. The day before, the Marians took the opportunity to invite the bishops to the premiere. All together, 67 of the bishops were able to attend, along with several hundred people who were benefactors of the film. This is all well and good, but it is now 27 1/2 years later. That was the first and last showing of Divine Mercy No Escape in Hollywood. Now, I’ve been given the opportunity to have a small showing of the original film at Family Theater Productions, Sunset Blvd. Hollywood. You may know of this place as the result of Fr. Patrick Peyton’s work to promote Family Prayer, and in particular to enlist the help of people in Hollywood for this cause. Many radio and television programs have been produced there over the years. I’m showing the movie as an example, with all the aspects that work, and attention also to things that don’t work or have become dated. The movie is very much a product of its age. It does introduce people to St. Faustina and the Divine Mercy message, but also tries to show mercy in action through examples from its time. The movie has a certain effectiveness, and certain scenes are still quite powerful, but some parts can be seen as a bit “quaint” by today’s standards. I want to show the movie primarily to Catholics that live and work in the Hollywood area to show both goals to shoot for and pitfalls to avoid. Perhaps the movie has a message for them–something unexpected. The point of the movie is spiritual enrichment, but it can also help foster new ideas to promote spiritual enrichment among those who work in media. The screening is on January 27, 2015. There will be social time at 6 PM with light fare and the movie will begin at 7 PM. Space is limited. Contact lbilleci@familytheater.org if you are interested.